The president proceeded to pump his fists and toot the horn 6 times. Donald Trump, trucker in chief? 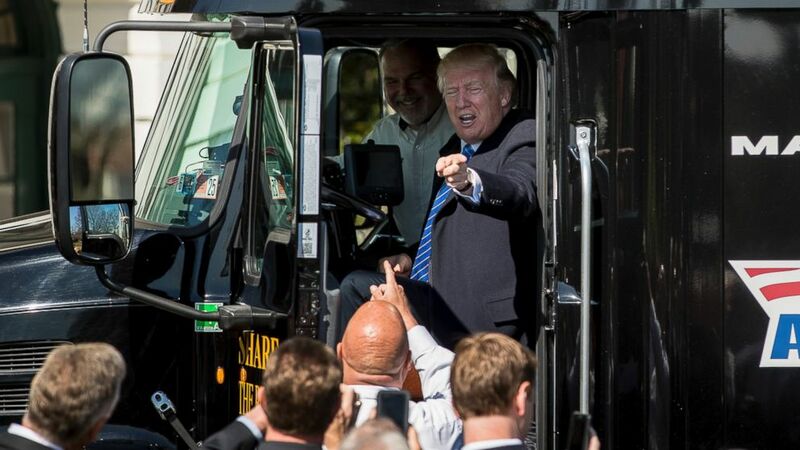 That's the role the president briefly assumed Thursday when he climbed into the drivers seat of a Mack 18-wheeler parked on the South Lawn of the White House. 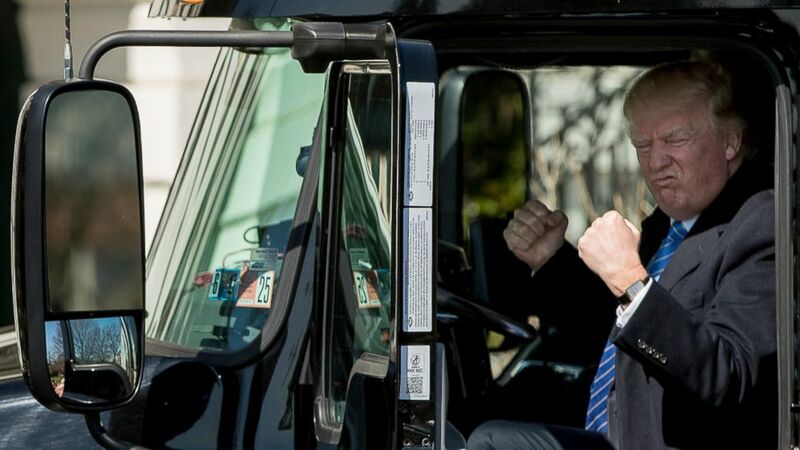 Trump, who wore an "I Love Trucks" button on his lapel, tried his best to emulate a truck driver: He enthusiastically pumped his fists, made a series of facial expressions that lit up the Twittersphere, and excitedly tooted the big rig's horn at least six times. (Andrew Harnik/AP Photo) President Donald Trump gestures while sitting in an 18-wheeler truck while meeting with truckers and CEOs regarding healthcare on the South Lawn of the White House in Washington, March 23, 2017. 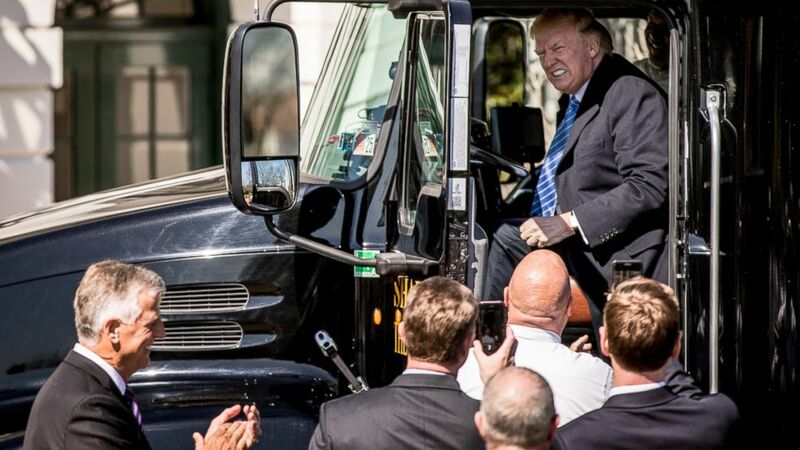 (Andrew Harnik/AP Photo) President Donald Trump jokes as he sits in the drivers seat of an 18-wheeler as he meets with truckers and CEOs regarding healthcare on the South Lawn of the White House, March 23, 2017, in Washington. And Trump clearly didn't run out of gas: following his spirited session of trucker role play, he met with truckers and CEOs from the American Trucking Association to discuss healthcare. "No one knows America like truckers know America," he said during the meeting. "You see it every day. You see every hill, and you see every valley and you see every pothole in our roads that have to be rebuilt." (Andrew Harnik/AP Photo) President Donald J. Trump sits in an 18-wheeler truck while meeting with truckers and CEOs regarding healthcare on the South Lawn of the White House in Washington, March 23, 2017.